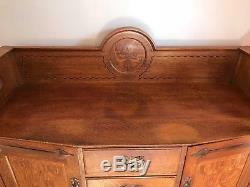 Antique Arts & Crafts "Shapland & Petter 2144". Stunning Antique Arts and Crafts Sideboard, Shapland and Petter c. 1900 - 1920, typical Art Nouveau design and Arts and Crafts detail. 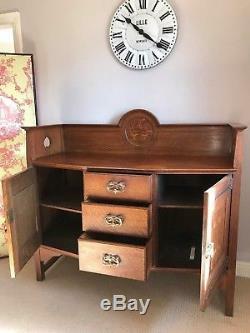 As you can see this looks superb, a real stunning, statement piece of furniture. 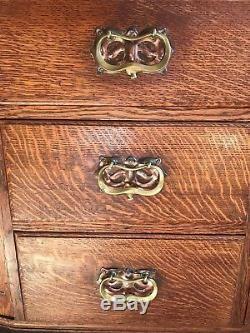 Oak, extremely well made quality construction, sturdy and structurally sound. The Oak top has historic dappled patina, marked by time and sunlight, have a look at the photos, there is a mellowed patchy patina, you could sand it and wax it. 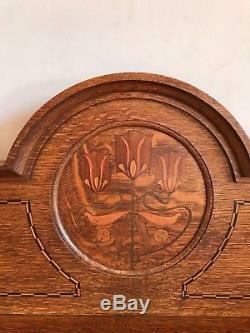 The Sideboard has a Splashback Plinth top to top and sides, with pierced cut out heart carved detail to each end and a striking centre disc inlaid with Art Nouveau flowers and a chequered black border around the plinth. Deep storage base with centre panel having three drawers. Drawers open and close easily, clean inside. Quality Dovetail joint construction to drawers. 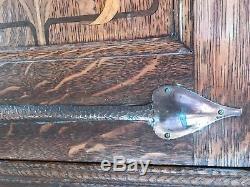 Superb decorative brass drop handles in wonderful shape over Copper Back plates, handles are all intact. 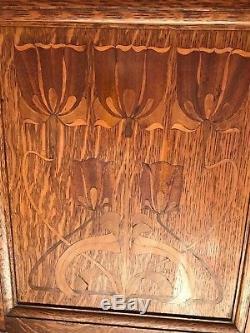 Cupboard either side with decorative inlaid Art Nouveau design to each door. Inlaid detail clean and intact. 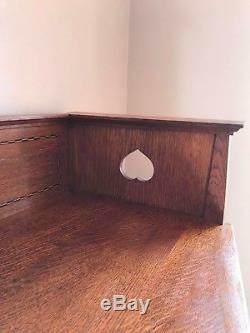 Heart shaped bars to cupboard tops and bottoms with hammered beaten decorative finish and brass rivet detail. The Beautiful Copper and Brass metal work all intact. With a little surface loss on inspection on the Copper in places but it is all in-keeping with age. The doors still lock and a key present. The cupboard inners are clean and shelf intact for extra storage. Standing on Sturdy Stretcher Base. Would have originally had little cap feet. 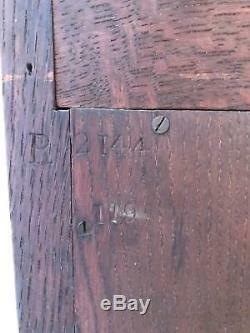 Has the Shapland and Petter Registration number "R 2144 / 119" stamped impressed to back. 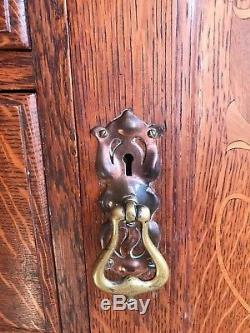 The locks are not stamped. See the photos, all sturdy and clean. A large and heavy piece of furniture. MEASUREMENTS: 141 cms wide x 60 cms deep, stands at 126 cms tall. MR FOX'S TERMS AND CONDITIONS. You will require suitable transport and I can assist with lifting and loading. We are centrally located but if you are too far away to collect in person you are welcome to arrange and pay for your own man and van courier. We are happy to liaise directly with your courier re. Directions and arranging a convenient collection time as there is no access to the estate if we are not around. We are a professional, friendly, family run team with a great reputation. 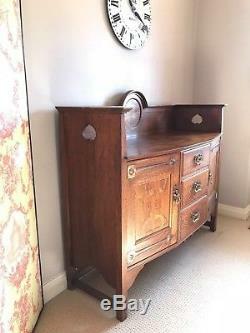 We source and sell furniture and antiques weekly from around the English Countryside. 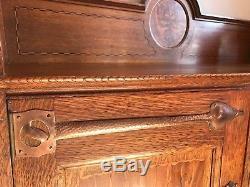 The item "Antique Arts & Crafts Art Nouveau Sideboard Oak Copper Brass Shapland and Petter" is in sale since Monday, March 26, 2018. 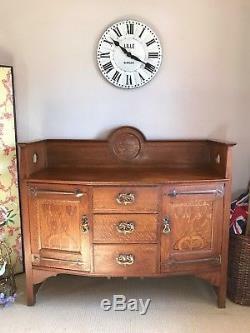 This item is in the category "Antiques\Antique Furniture\Sideboards\20th Century".fox" and is located in Staythorpe, Newark On Trent, Notts. This item can't be shipped, the buyer must pick up the item.